A lifelong Parisian, Henri Adolphe Laissement was probably born into an economically comfortable family sometime in 1854. During his childhood, Paris was undergoing a vast modernization project under the direction of Baron Georges-Eugène Haussmann, prefect of the Seine. This grand renovation was commissioned by Louis-Napoléon Bonaparte, who was elected president of France in 1848, but then staged a coup d’état in 1853 to become Emperor Napoleon III. Haussmann’s charge was to bring the capitol city into the modern age by designing new infrastructure systems and roads, creating whole new residential districts and by razing the medieval slums that had long been a breeding ground for cholera epidemics. In short, it was a time of profound transformation not only of the city itself, but of the lives of all Parisians. The magnitude of the physical changes in Paris were mirrored in its cultural evolution as well. Traditional art forms, whether in painting, literature or music, were increasingly challenged by a generation of artists who embraced Realism as the aesthetic of the modern industrialized world. The so-called “Realist Salon” of 1849-50 introduced Paris to the controversial works of Gustave Courbet, and established the Barbizon School painters as harbingers of a new way of approaching visual arts in general. In 1863, Realist painters reached a turning point when the jury for the annual Salon exhibition rejected more than 3000 artworks; Napoleon III resolved the crisis by declaring that the public should judge for itself whether the rejected art deserved the jury’s disapproval. The alternative exhibition, today known as the Salon des refusés, proved to be a seminal rallying point for avant-garde artists for the next three decades. Edouard Manet’s Luncheon on the Grass and James McNeill Whistler’s Symphony in White no. 1 were considered particularly inflammatory not only because of their radically “un-academic” styles, but also because the subject matter of both paintings was based on the lives of contemporary people. Simultaneously, the poet and art critic, Charles Baudelaire, published an essay entitled “The Painter of Modern Life” in which he maintained that the daily life of Parisians was the only credible subject of contemporary art. For the young Laissement, the art world must have seemed both exciting and a little dangerous in t he 1860s. From the perspective of a bourgeois family, the prospect of challenging the existing art establishment would undoubtedly have seemed foolish, if not downright risky. There is no record of Laissement’s art education until he was enrolled at the Ecole des Beaux-Arts in the studio of Alexandre Cabanel (1823-89); however, he undoubtedly received substantial training in order to qualify for admission to the Ecole. Based on Laissement’s age and the political upheaval of France in 1870-71, it seems most likely that the young artist began his studies at the Ecole after the conclusion of the Franco-Prussian War and the Commune, probably in early 1872 at age eighteen. During the 1870s, Cabanel was a widely admired painter and professor; his students included both traditional academic artists and more experimental painters such as Jules Bastien-Lepage and Emile Friant, both of whom were leaders of the emerging Naturalist movement. Laissement would surely have been aware of these artists as well as the Impressionist painters who began exhibiting independently in 1874. His training with Cabanel is most evident in his flawless drawing technique and exquisite rendering of color. Laissement made his Salon debut in 1879 at age twenty-five. Typically, a successful entry into the official world of Salon artists meant the beginning of a promising career, and Laissement was no exception. He seems to have focused primarily on portraiture in the years immediately following his debut. Of particular note is a portrait of his friend Léon Melchissédec, a lyric singer who made his debut at the Paris Opera in 1879, the same year that Laissement made his debut at the Salon. The 1882 painting shows Melchissédec in his debut role as Prince Nevers in Giacomo Meyerbeer’s 1836 opera, Les Huguenots. At the 1885 Salon, it bore the simple descriptive title Melchissédec dans Les Huguenots, (Musée d'art Roger-Quilliot, Clermont-Ferrand, France) along with the artist’s inscription “To my friend Melchissédec”. The painting reveals both traditional and more experimental tendencies in Laissement’s work; the richly costumed figure is meticulously developed in the accepted academic style, but the ambiguous background defined by subtle gradations of light owes a great debt to the work of Manet. Another securely dated work from the 1880s is The Lady in Red (private collection). Signed and dated 1885, this portrait of an unidentified woman shows the growing influence of Naturalist painting, specificaly in the free brushwork and the casual pose of the sitter. Likewise, the painting entitled Reconcilable Differences, (private collection) shows a domestic scene with a humorous twist, but within the context of a compositional strategy that suggests extensive study of Edgar Degas’s work. It would seem that Laissement was beginning to find his own aesthetic voice, and to develop confidence as a painter. These years brought further success at the Salon as well, with honorable mention awards in both 1882 and again in 1889. It was sometime during the late 1880s or early 1890s that Laissement became one of the leading painters of genre scenes featuring Cardinals of the Catholic church. This type of painting was very popular with the French public, and Laissement seems to have found a steady audience for these usually small scale canvases. Some are gently humorous, such as A Divine Cup of Tea, which shows a portly cardinal enjoying his tea from an elegant porcelain tea set in a sumptuously designed room. In contrast, Afternoon Refreshment treats the same subject, but this time with a cardinal and a bishop standing in front of a window (again in a beautifully decorated room) and sharing not only a cup of tea, but clearly some gossip as well. 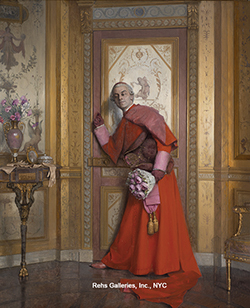 The Naughty Cardinal from 1895 depicts one of the “princes of the church” dressed in full red regalia and carrying a bouquet of flowers as he knocks on the door to the suite of his romantic partner. 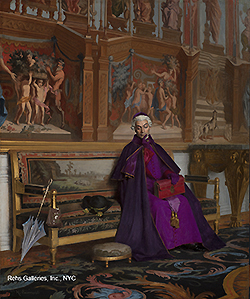 The anticlericalism of this image reflects a historically accepted attitude in French art, but it is somewhat out of character with Laissement’s usually gentle jabs at the church hierarchy; in this case, his good-natured revelation of all too human foibles has become a pointed satire of hypocrisy in high places. Laissement also expanded his horizons during the last decade of the nineteenth century with the mass reproduction of his paintings in the form of etchings and photogravures as well as with the design of book illustrations. He contributed a number of etchings to Georges Bois’s collection of poems, Les Damnées, published in Paris by E. Dentu in 1890. The subject matter of “the damned” may well hint that Laissement was involved in the Symbolist circles of the Paris art world or it may simply be that he needed the work. By the very end of the century, however, he was again receiving official recognition for his paintings, with a third class medal in 1898, a bronze medal in 1900, and a second class medal in 1905. The last record of Laissement at the Paris Salon dates from 1912 when he exhibited A Corner of the Rose Garden. 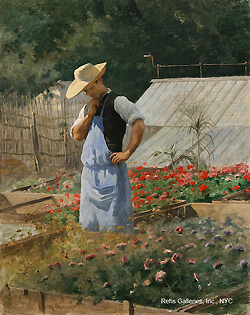 This small painting returns to a Naturalist aesthetic with an image of a blue-aproned gardener mulling over his rose seedlings on a sunny day. It is a freely painted and strikingly direct image of an ordinary man at work in his garden. Virtually nothing is yet known about the last decade of Laissement’s life. He continued to live in Paris, and was undoubtedly troubled by the grueling human cost of World War I, but there is no record of his personal life during these years. He died on April 12, 1921. [i] Illustrated catalogue of the valuable modern paintings belonging to Mr. Julius Oehme, New York City (New York: American Art Association, 1911). Sadly, shortly after this sale closed, Mr. Oehme was sued by the federal government for fraudulently importing the art work into the US. See New York Times, February 7, 1911.